Designed by VST (of ExtractMojo fame) in collaboration with La Marzocco. Available in 15, 18, 20 and 22 gram sizes. Ridged design. 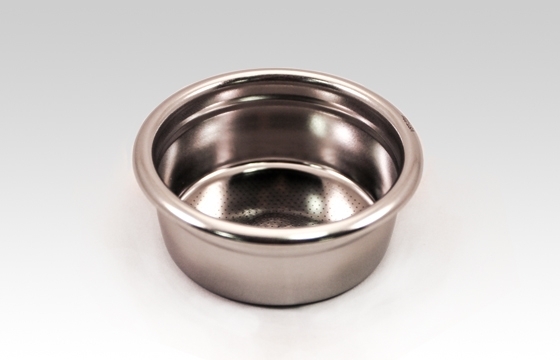 Fits most standard 60mm portafilters (see details below). The VST baskets are designed for consistency from shot to shot and basket to basket. They deliver a consistent extraction as ristretto, normale or lungo with minimal change in the grind setting. The screen holes are cut using a new fabrication process for exceptional precision and consistency in the holes and pattern. 22-g fits all La Marzocco and Synesso and most Nuova Simonelli models using their standard portafilters. 20g, 18-g & 15-g fits most La Marzocco, Synesso, Nuova Simonelli, Faema, La Cimbali, Rancilio with standard portafilters. Check height specification (in mm) in PDF document and compare to the depth available in your portafilter. Note: If you are unsure of portafilter depth compatibility, we recommend using a bottomless portafilter.